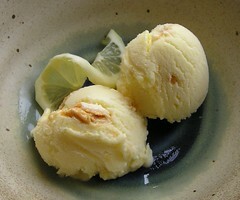 Lemon Meringue Ice Cream - Do You Know The Muffin Man? Notes: Used homemade meringue and substituted store-bought lemon curd for the lemon syrup. There's a lot of lemon flavour in my adaptation: a few drops lemon extract in the meringue, lemon zest infused in the cream and Liberty lemon Méditerranée yogurt (8%) instead of plain Greek yogurt. On the whole, it's a bit too sweet: I think the lemon curd and yogurt contain enough sugar that I should have reduced the amount in the base.